Would Twitter trends exist if pop culture didn’t? Dominating international Twitter trends this week are shoutouts to heartthrob band members, celebrations of music around the world and tributes to historical American idols. If you haven’t heard of the popular boy band, One Direction, you probably haven’t been following Twitter trends of the last…year. 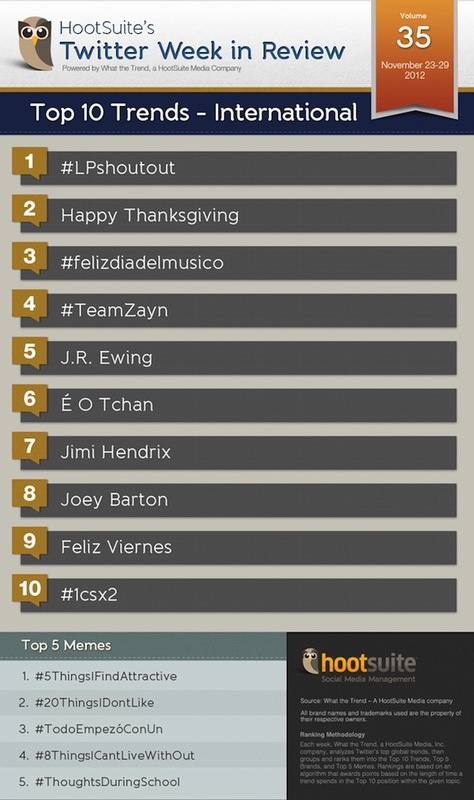 The top international Twitter trend of the week is #LPshoutout, which refers to One Direction member, Liam Payne. So why are thousands of fans (often called ‘the 1D nation’) giving Payne shoutouts? Just like all pop celebrities throughout history, this heartthrob band currently has the mega limelight on it. Every move is photographed and amplified in tabloids, news and social. Liam Payne was in the news this week for a few reasons, including rumors that he was dating pop singer Leona Lewis and that he insulted Kim Kardashian. Both rumors are allegedly untrue, so Liam took to social to clear up his name. Okay bored of constant news articles… I’m not dating Leona … My YouTube channel isn’t for a solo career and I didn’t insult Kim k…Pow! Pop, rap, folk, classical, dance, country, punk, church. On November 22, many countries across the globe celebrate an international day of music and musicians. #Felizdiadelmusico, spanish for “happy day of music,” trended in honor of the holiday last week. Dedicated to Saint Cecilia, patroness of musicians and Church music, the date commemorates her death because, as she was dying, she sang to God. On November 22, Roman Catholic, Anglican, Eastern Orthodox, and Eastern Catholic Churches feast in commemoration of the martyr and patron saint of musicians. 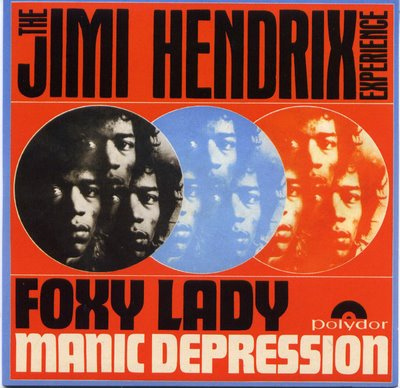 Born November 27, 1942, the infamous rock star Jimi Hendrix would have celebrated his 70th birthday last week. The thought of the legend turning 70 is mind-boggling to thousands. Hendrix has become iconic to an era. The rebellious rockstar and badass heartthrob, he will forever remain in his 20s in the hearts of an entire generation (and eco-baby-boomers in a 60s and 70s rock resurgence). For many, Jimi Hendrix’s guitar was a generation’s voice that spoke of war, rebellion and despair. To pay tribute to the musician and American idol, thousands took to the Twittersphere. Hollywood star Larry Hagman, famous for playing one of American soap opera’s most supreme villains, J.R. Ewing, on the popular show “Dallas,” died on November 23rd at the age of 81. It was his role as the arrogant, conniving and amoral oilman J.R. that landed Hangman instant fame. In the early 80s, “Who shot J.R?” became the question that millions of Dallas devotees asked, after the villain was mysteriously gunned down in a cliff-hanging episode. This character trended across the Twittersphere last week in honor of Hangman’s death. 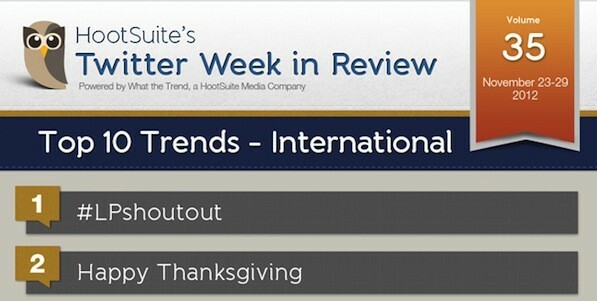 Join us next week for another look into the International Trends of the Week on Twitter.